Tim Hortons continues to out-America America. Do you have baller weekend plans, like going to the New York State Fair? 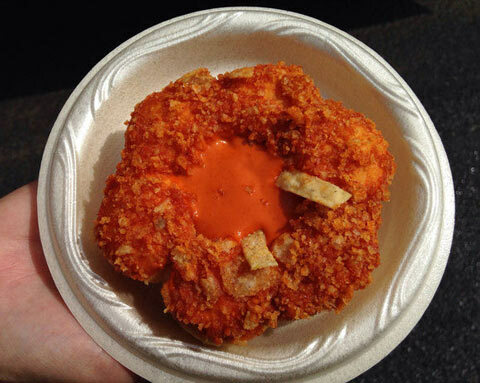 We hope you do, because you’ll be able to taste an exclusive new Tim Hortons monstrosity created just for the 2014 fair: the Buffalo Crunch Doughnut. According to Grub Street, it’s exactly what you’d expect from something with that name: a sweet, yeasty pull-apart doughnut dunked in Buffalo sauce, then crusted with crunched-up tortilla chips and garnished with a couple of whole tortilla strips in the center. It comes in mild and hot varieties; If you order the mild, the heat is balanced with creamy ranch dressing. Both are available for $2 a pop. No wonder Burger King decided to bid to buy Tim Hortons for $11.4 billion. Yesterday, Market Watch threw out the suggestion that the Burger King/Tim Hortons merger could be the beginning of the mainstream fast-food-ization of the Luther Burger. We’re sticking with our fast-food Voltron theory: food creations like this are how empires are made. World takeover bid? Tim Hortons has got this.